Volkstrumgwher 45 "The rivet gun"
How often do you use the VG-45? Hi! My name is FH2Max3 and today I will discuss the VG-45, that is available in game as a panzerfaust kit. The Volkssturmgewehr ("People's Assault Rifle") is the name of several rifle designs developed by Nazi Germany during the last months of World War II. They share the common characteristic of being greatly simplified as an attempt to cope with severe lack of resources and industrial capacity in Germany during the final period of the war. The weapon's name is an ambiguous portmanteau: in German Gewehr means "rifle", whereas Sturmgewehr means "assault rifle". The term "Volkssturmgewehr" can therefore be translated either as "People's Assault Rifle" or "Volkssturm Rifle". The Gustloff Volkssturmgewehr was designed by Karl Barnitzke of the Gustloff-Werke for the Primitiv-Waffen-Programm ("primitive weapons program") in 1944 and was intended to be used by the Volkssturm. Production of the Gustloff Volkssturmgewehr occurred from January 1945 till the end of the war; roughly 10,000 were made. This gun was initially called MP 507. The MP 508 was fairly similar except it had a semi-pistol grip stock. The weapon employed the same 7.92×33mm Kurz intermediate cartridge as the earlier StG 44 assault rifle and also used the same detachable 30-round box magazine. The Gustloff Volkssturmgewehr uses a gas-delayed blowback action based on the Barnitzke system, whereby gas bled from the barrel near the chamber creates resistance to the rearward impulse of the operating parts, which ceases when the projectile leaves the muzzle, allowing the operating parts to be forced rearward by the residual pressure of the cartridge case. This principle has been used most successfully in the Heckler & Koch P7 pistol. The Gustloff Volkssturmgewehr is constructed rather like many semi-automatic pistols, it has a casing and spring around the barrel; the whole casing recoils backward. The breech block, with firing pin and extractor, is pinned to the back end of the barrel casing. The rear end of the gun does not recoil and has the hammer, sear and trigger built into it. Gas coming from four vents, near the end of the barrel, holds the bolt closed till the gas pressure drops to a safe level. Some selective fire Gustloff Volkssturmgewehrs were made. The Grossfuss Sturmgewehr used the same principle of gas-delayed blowback operation, but it was somewhat more efficient in the use of gas; its bolt weighed 0.8-0.9 kg compared to 1.4 kg in the Gustloff Volkssturmgewehr. The Gustloff Volkssturmgewehr was assembled out of 39 metallic parts, not counting rivets and screws. Of these specific parts, 12 required milling, 21 could be produced by stamping alone, and 6 were springs. Ok, lets move on to the usage ingame. For those of you looking at a simple answer on what is it, I can give you it: It is a STG-44 jammed on semi-auto mode. But in more detail, the weapon has some crude sights, and a strange noise that resembles a rivet gun. This weapon requires special usage, as at long-range you will likely miss, and at close range, you will likely be out-gunned by smgs. The tactics resemble the ones used by the M1 Carbine. Although the recoil is higher, the bullet is more powerful. Also, don't forget your Panzerfaust 100, which has the longest range of all the single-shot anti tank launchers. This weapon currently is only available as a pickup kit on Seelow heights. However, the VG-45 is very rare among German anti-tank soldiers, who prefer the K-98 over the Volksturm weapons. Thats it for today and see you later! 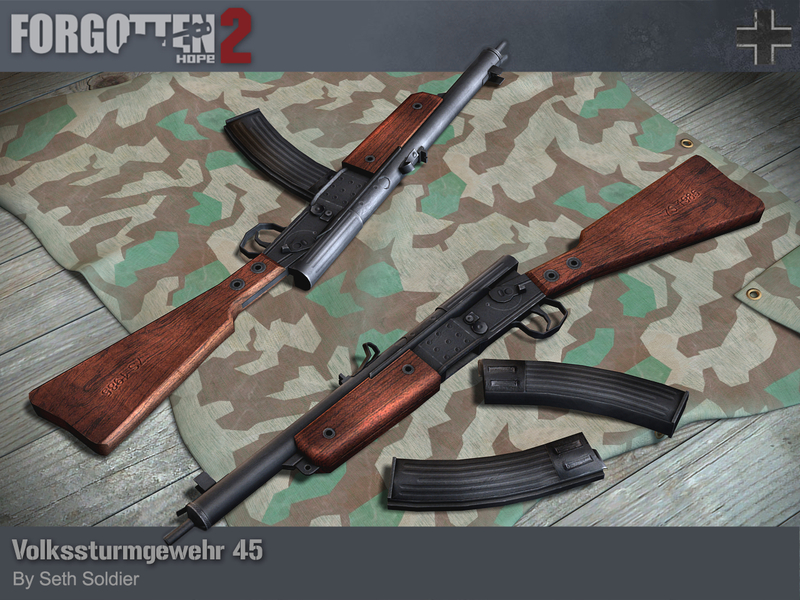 Re: Volkstrumgwher 45 "The rivet gun"
The Volkssturmgewehr 1-5 is how I discovered & downloaded FH2 in the first place! It has always been my top favorite gun above all others in the world. I was searching on imfdb.org to see if there were ANY games at all featuring this rifle and saw there is only one single game ever with it, and that's Forgotten Hope 2. I looked it up, watched vids, saw how amazingly realistic it is, how many maps there are, the hundreds of different & legitimate weapons/vehicles and downloaded it. Oh and being able to actually play as Germany is awesome, I've wanted an Axis FPS for like 23 years now. Right off the bat I could see it had a bit of a learning curve (being I hadn't played any Battlefield games for 9 years) and I knew I was going to love it. Very first map I played was Seelow Heights, took me a bit of searching but I finally found both the VG 1-5 & VK-98 (single-shot) kits. Thus far I've only found two VG 1-5's beside the church in downtown Seelow next to the PaK 40, and the VK-98 inside a house at "Manor". I've tried finding more but that's it. Every time I play Seelow I sprint straight to the church to pick up the VG 1-5 & Panzerfaust 60 then I hop in a vehicle of some sort. Preferably the Tiger II, although it's odd because it doesn't seem to spawn for quite awhile. Anyway I'm currently saving for my own reproduction yet functional Volkssturmgewehr 1-5 when the gun company finally finishes tooling their shop and starts manufacturing them. Supposed to be $4000 when released, a lot of money but I just love the VG 1-5 that much. Love the history behind it, and the unique design. Plus a genuine one costs $20,000 - $50,000 so that'll never happen, but I'll be happy with a reproduction! Anyway I'd like to use the VG 1-5 & VK-98 on other maps, is it possible to modify the game files to place it on more SP Co-op maps? Also are there any new third party made Eastern Front maps available for download? Pro tip: if you pick up a (rare) pickup kit it is kind of frowned upon if you jump into a vehicle afterwards. Why? Because in that vehicle you aren't gonna use the pickup kit anyway, especially if it's the Tiger II. So my suggestion would be: play the kit or play the vehicle. Enjoy FH2 and see you on the battlefield! He is playing singleplayer only, so noone cares what kit he uses how. Oh, yes I haven't been able to play Seelow Heights 64 on MP yet & have never seen these pickup kits on the smaller version of the map. Also I don't get to drive tanks very often on MP as they're generally always in use already. Last time I tried driving a tank some random player reported me saying it was "his" tank even though he was dead. Admin gave me a warning. I guess I didn't know 762 has a rule making it so players can place claims on tanks. Regardless I'm hoping to get the chance to use the VG1-5 & VK-98 more often MP. The Eastern Front maps are my favorite though they don't seem to come up too often on the server. I guess I didn't know 762 has a rule making it so players can place claims on tanks. There is no such rule afaik. Some players claim tanks, but they actually don't have any rights to do so. Of course it is nice and courteous if you let someone else drive a tank if you drove it before, especially if he is waiting on it's spawpoint before you. He can't claim however, because that would mean that nobody else in that round can drive that tank anymore and that is ridiculous. 762 just has a wait in line rule. if someone is ahead of you in line, you have to let them have the tank, kit whatever they're waiting for. they also have to make it clear they're waiting for it. I remember on Totalize I was waiting for Tiger, and when it spawned, I jumped in. Then a guy, who was waiting for Tiger later than me ran up and started saying that I was farther than 5 meters from the tank, and I should get out.